Polls closed on Wednesday in a national election that looked too close to call, pitting former cricket star Imran Khan against the party of jailed ex-Prime Minister Nawaz Sharif. The Election Commission of Pakistan said voters who were still inside polling booths at the close at 6 pm (1300 GMT) could complete the voting process. The likely winner should be known by around 2 a.m. local time on Thursday (2200 GMT Wednesday). The day has not been without violence, as interparty violence and massive militant attacks have left dozens dead. In the western city of Quetta, at least 31 people were killed and dozens more injured in a Daesh suicide attack outside a polling station, police and local media reported Wednesday. A suicide bomber, acting alone, tried to enter a polling station on the eastern outskirts of Quetta, capital of the southwestern Balochistan province, but blew himself up when he was tackled by security personnel, local broadcaster Express News reported. The blast took place near a long queue of voters, the channel reported. City police chief Abdul Razzak Cheema told reporters that the dead included five policemen. Authorities fear a rise in the death toll as several injured were in critical condition. Daesh terror group later claimed responsibility for the attack via its AMAQ news agency. Another explosion rocked a polling station in the Larkana district of the southern Sindh province, the hometown of slain Prime Minister Benazir Bhutto, injuring four people, Express TV reported. In a village near the northwestern city of Sawabi, Pakistani police said a shooting between supporters of two opposing political parties left one person dead and wounded two people. Police officer Khalid Hamdani said it was unclear what triggered the shootout between a group of supporters of the secular Awami National Party, which has often been targeted by the Taliban, and the Tehrik-e-Insaf led by former cricket star Imran Khan, a center-right party. Hamdani says the situation is now under control and voting is underway in Col Sher Khan village. Ahead of Wednesday's balloting, over 170 people — including three candidates running in the elections — were killed in suicide bombings in southwestern Baluchistan and northwestern Khyber Pakhtunkhwa provinces. 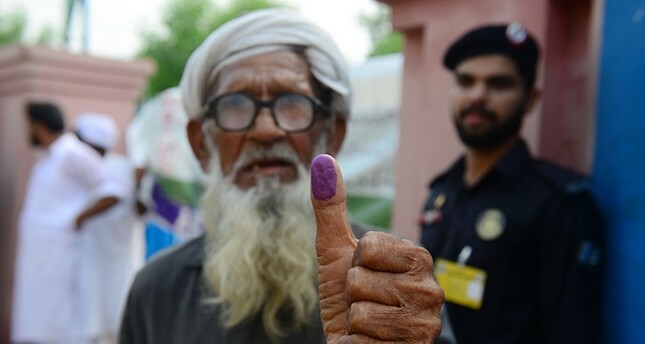 More than 100 million registered voters will cast their ballots across Pakistan in a nail-biting end to an intense general election process that has been marred by claims of rigging and terrorism. The ballots will be cast for 272 general seats of the lower house -- also known as the National Assembly -- and 577 general seats of the country's four provincial assemblies. Around 50 political and religious parties are taking part in the elections, which have been marred by allegations of "manipulation" and "engineering". The main contest is expected to be between three mainstream political parties and a five-party religious alliance. The fiercest part of the race is expected to be between the two right-wing parties -- the Pakistan Muslim League (PML-N) of three-time Premier Nawaz Sharif, who is currently in jail following a corruption verdict against him, and the Pakistan Tehreek-i-Insaf (PTI) led by former cricket star Imran Khan. The Pakistan Peoples Party (PPP) of slain prime minister Benazir Bhutto and religious alliance Muttahida Majlis-e-Amal (MMA) are also in the running. According to the latest surveys held by Pakistani think-tanks, a neck-to-neck contest is expected between the PTI and the PML-N. The PTI enjoys the support of 30-32 percent of voters whereas the PML(N) is the preferred choice of 27-30 percent of voters. The PML(N), however, has an edge over PTI in Punjab, the country's most populous province and political powerbase.